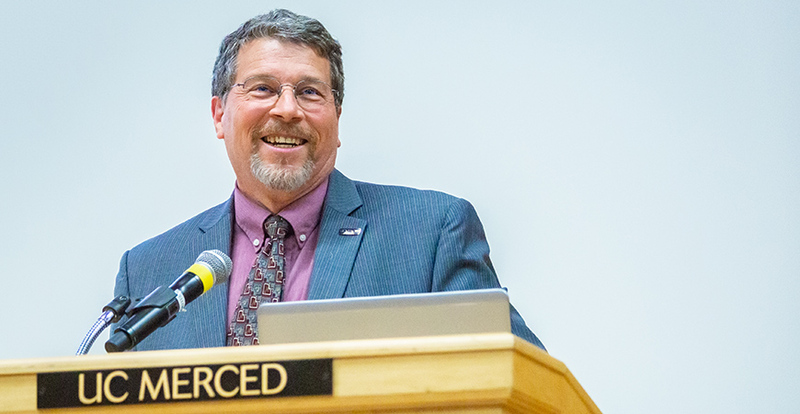 The University of California, Merced, today announced the appointment of longtime faculty member and administrator Gregg Camfield as Executive Vice Chancellor and Provost. Camfield has served in the role on an interim basis since the retirement of Thomas W. Peterson on June 1. His appointment follows a nationwide search that included input from throughout the campus community. Camfield, a scholar of American literature and culture and the Vincent Hillyer Chair in Early Literature, joined UC Merced in July 2007. As the university’s new executive vice chancellor and provost, he will provide leadership for campus administrative operations and serve as the university’s chief academic officer. Responsible for planning, development and improvement of all academic programs, policies and infrastructure, Camfield will oversee faculty recruitment, retention and renewal processes, as well as the rigorous review of faculty appointments, tenure and promotion. He will also oversee the planning, quality and delivery of student education, working closely with the Merced Division of the University of California Academic Senate. Gregg Camfield is a distinguished scholar and has been a steady presence on our campus for years, and he is well positioned to lead us to the next level of academic distinction and research excellence. In addition, he will convene vice chancellors and other senior administrators to address issues that cut across divisional lines, oversee the campus budget-request process, and lead strategic planning and other strategic campus initiatives in close collaboration with the chancellor. In his time at UC Merced, Camfield has served as chair of UC Merced’s initial accreditation team, chair of the Undergraduate Council and chair of the humanities faculty group. Most recently, he served for four years as UC Merced’s first Vice Provost for the Faculty. Camfield earned his bachelor’s degree from Brown University and his doctorate from the University of California, Berkeley. He has held academic appointments at the University of Pennsylvania and at the University of the Pacific, where he also was director of the University Honors Program. He has authored two books on Mark Twain, one on American literary humor, and several editions. He has also published more than 40 scholarly research articles and reviews, and has shared his scholarship more broadly by contributing to websites, museums, government reports, school curricula and documentary films.